A graduate from Offshore & Marine Engineering Design (Higher Nitec), Reza heard about the TETA programme from his lecturer in ITE. 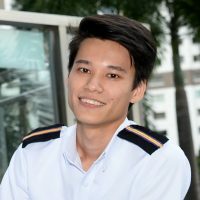 Encouraged by his lecturer and inspired by a friend who is a Deck Cadet, he is determined to take seafaring as a career. He sees TETA as a comprehensive and well-defined programme that prepares him well for his future seafaring career. The programme serves as an added advantage as Reza is able to secure a place in a company before the start of the programme. He also benefits from the training allowance for both pre-sea and classroom training.